This campaign acknowledges that Frontier Airlines doesn’t have the best rep, some of us don’t either. 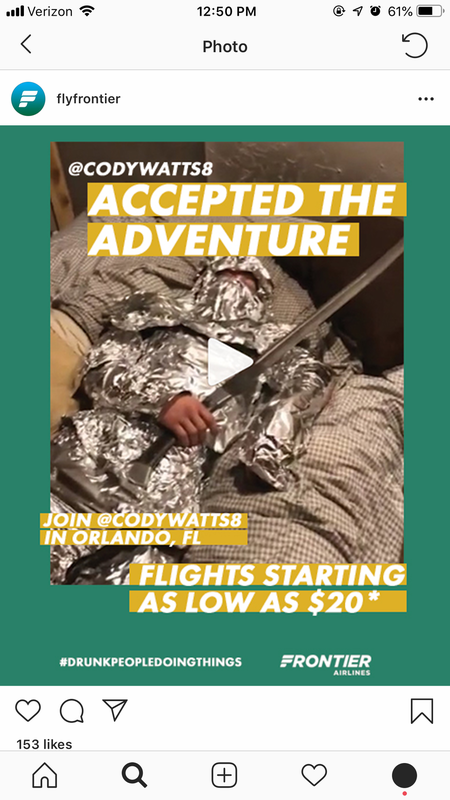 We chose to embrace the mistakes in us all and challenge real people that were featured on @drunkpeopledoingthings to accept an adventure relating to their featured video within 48 hours. Direct call outs on Instagram to users featured on @drunkpeopledoingthings. Frontier challenges the user to accept the free trip given within 48 hours.